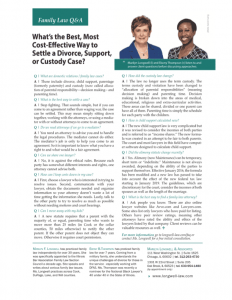 Answers to some common legal questions about family law cases: divorce, custody, paternity, etc. Marilyn Longwell & Associates, P.C is a law firm concentrating in family law, including parentage, dissolution of marriage, and custody. Marilyn Longwell, the founder, has a reputation of serving clients with competence and vigor. A former finalist for Cook County Associate Judge, and frequent court-appointed representative of children, Longwell graduated from DePaul University College of Law. Longwell has litigated cases in both state and federal courts, has contributed articles to numerous publications and is a frequent expert speaker on family law. The legal system is not easy to navigate for non-lawyers and does not have a positive effect on families. We have tried to answer some basic questions here. 1. I want to get divorced. How long will it take? The length of time to complete a dissolution of marriage depends on you and your spouse. From the time you agree on terms, your divorce can be completed in a very short time. If no agreement can be achieved, you may have to wait over a year to have a trial or work out a settlement. 2. We were never married and now we are breaking up. Can I get custody of my children? The new term for custody is parental responsibilities, meaning making major decisions for the children. The majority of these cases are settled, often by joint decision-making agreements or buy dividing areas of decision-making. 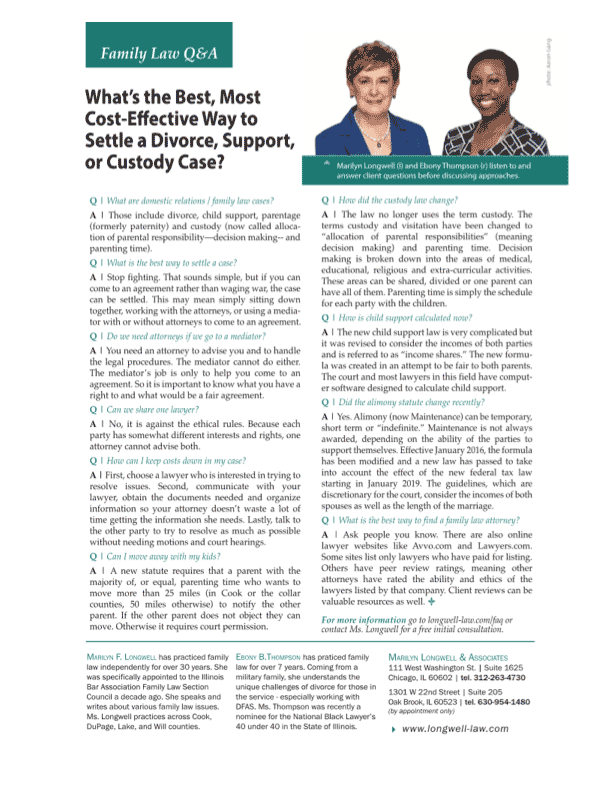 We have been successful in many parentage cases in getting a shared decision-making agreement. This issue is separate from parenting time. 3. How is child support calculated? Child support used to be a specific percentage of the net income of the “non-custodial” parent. Over the years adjustments were made for situations where the parents divided the children’s time more evenly. Now a complicated formula is in the statute which takes into consideration each parent’s income as well as some other factors, including whether each parent has at least 40% of the time with the children. We use software to do the calculation as does the court. 4. What is “marital property”? Marital property is all property acquired after the marriage except by gift or inheritance. Property owned before the marriage is not marital. If any nonmarital property is placed in joint names, it is presumed to become marital, but the party who contributed it is sometimes entitled to reimbursement. The name in which title is held does not necessarily determine whether property is marital. 5. How much property am I entitled to? Although Illinois is not a community property state, the presumption is that each party is entitled to 50 percent of all marital property. Various factors are taken into consideration to reach the actual division such as: length of the marriage, relative earning abilities of the parties, contribution to the marriage, and whether either spouse has hidden or used property not to benefit the marriage. Neither party’s conduct can be basis for distributing property. 6. The dad and I were never married. Do I have to prove that he is the father of my children? If the father signed a Voluntary Acknowledgement of Parentage (VAP), you do not have to prove that he is the father. You will simply need the VAP and you can move straight to child support and possibly parenting time (formerly visitation) and parenting responsibilities (aka decision-making or custody). 7. Will I get alimony? Alimony is now called maintenance. It used to be discretionary with the court and as a result, judgments which ordered maintenance varied wildly. Now the legislature passed a statute designed to make maintenance orders more uniform. The formula is based upon the incomes of both parties as well as the length of the marriage, measured to the date that a party files for divorce. The question as to whether a party will receive maintenance is still a matter of some discretion for the court. 8. Do I have to give back my engagement ring? 9. Do I really need a lawyer? In some cases involving no children and little property, an attorney is not necessary. The law now provides a do-it-yourself procedure for the very simplest cases. The clerk of the court can assist you if you qualify. The biggest question to ask yourself in such cases is whether you want to do it alone. A lawyer will be able to make the process less emotionally draining and be sure the paperwork is correct. 10. Can we both use the same lawyer? It is unethical for a lawyer to serve two clients whose interests are conflicting. Because you and your spouse, or you and the other parent, will have different interests which must be protected, you have conflicting interests even if you can agree on the outcome. However, one of you can have a lawyer who will do all of the paperwork and will negotiate with the other party. 11. Can we just use a mediator? There is nothing wrong with using a mediator to reach an agreement. However, mediators cannot give legal advice to either person. You will ultimately need to have an agreement put into writing and entered in court proceedings. This is true even in a paternity situation for the agreement to be enforceable. Divorce proceedings are even more complicated. You are best served by having an attorney who will be sure you understand your legal rights before you mediate your situation. A last word of advice. Choosing a lawyer for any legal matter must be done carefully, but there are lots of competent attorneys around. So, hire someone who is competent and with whom you feel comfortable, someone you will want to deal with over what could be many months. If you have any questions about any other divorce, paternity, custody or other family law issues, we will be happy to discuss them with you. © Copyright 2019 Marilyn Longwell & Associates, P.C. © 2018 Marilyn Longwell & Associates, P.C. | Design: Sasso Marketing, Inc.